After the death of William F. “Buffalo Bill” Cody in 1917, his niece Mary Jester Allen (1875–1960) committed to establishing a museum in her uncle’s name. Determined to keep Cody’s chronicle alive in the town of his founding, she helped orchestrate a $5,000 memorial appropriation from the State of Wyoming in 1917 into a log structure that opened its doors in 1927 as the Buffalo Bill Museum. Mrs. Allen worked with the museum until her last visit there in 1960. Throughout her tenure, she guided the museum, watched it grow into a multi-structured facility, shepherded it through a depression and two world wars, and helped enrich its holdings. She managed the acquisition and transport of Buffalo Bill’s family home from LeClaire, Iowa, to Cody in 1933. Were it not for Mary Jester Allen, the Center of the West would never have become the formidable institution it is today. 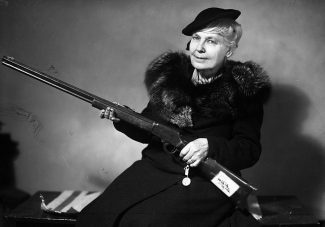 Here, she is pictured with a rifle that once belonged to Frank Butler, husband and manager of Annie Oakley—and a good shot in his own right.